The house sparrow (Passer domesticus) is the most common bird in the world, and a possible contender for the title “world's most common animal” as well. Having evolved in close association with humans, it followed us as we spread across the globe and exists in almost every place we do, from Africa and much of the East, to Europe and the Americas. Most of the sparrows you see around you are this prolific species, while many other common sparrows are subspecies of this familiar little bird. In North America, in addition to the ubiquitous house sparrow, there are about 3 dozen other sparrow species. Of these, perhaps some of the more common around backyard feeders are the white-throated sparrow (Zonotrichia albicollis) with its bright yellow eyebrow patch and distinctive call, the tree sparrow (Spizella arborea) a familiar winter visitor, and the unassuming little song sparrow (Melospiza melodia) with its melodious voice. All have similar beaks, though the song sparrow's beak is somewhat shorter and thicker than the average sparrow. Part of the sparrow's success story has to do with the efficiency of its most valuable tool -- its beak. The somewhat stubby but sharp, cone-shaped beak is a near-perfect multi-tool, capable of crushing seeds in a vise-like grip, pecking at bark like a chisel to dislodge hiding insects, or opening wide to net bugs in flight. 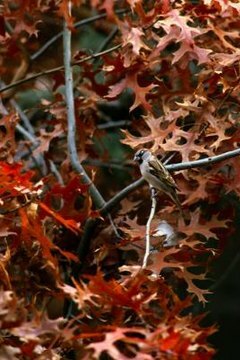 Unlike the thicker beaks of finches and grosbeaks -- who primarily subsist upon seeds -- or the narrower, pointy beaks of warblers and other insectivores, the multi-purpose beak of the sparrow ensures it can find something to eat almost anywhere. It thrives in a multitude of habitats from open fields and gardens to woodlands. Technically a bird's beak is merely the external portion of the entire mouth apparatus that is more correctly termed the bill. The bill consists, not only of that portion we see and think of as the beak or rostrum -- the hard, tool part -- but also the nostrils, the bony internal support upon which the beak is “glued”, the tongue and so forth. The beak itself consists of two horny sheathes, one attached to the upper jaw -- called the maxillary rhamphotheca or rhinotheca -- and another over the lower jaw -- known as the mandibular rhamphotheca or gnathotheca. In addition to having the correct tools available, it's usually a good idea to keep those tools in tip-top shape so they can keep doing what they do best. Fortunately for birds, whose lives depend upon keeping their highly specialized toolkit in good working order, their beaks never stop growing. The beak is made of a substance called keratin -- the same proteinaceous substance that comprises hair, fingernails and hooves. As the beak wears down with continued use, it is constantly replaced in the same way our hair and nails are replaced after they break or are cut. Bird Source: The Great Backyard Bird Count: What's That Sparrow?